Forget leading if no one’s listening. The right to be heard is earned. Release the burden of knowledge. When you “know” the answer you feel burdened to share the answer. Open your mind by whispering, “I could be wrong,” to yourself. People don’t enjoy listening to a know-it-all. Invite people to talk about themselves. They’ll listen to you if you’re open to them as people. If you want people to listen to you, listen to them. Talk less. People listen when you talk less. If you have authority or position, it’s almost certain that you talk too often and too long. Soften tone and lower volume. Try a whisper rather than a yell. Get to the point quickly. Add explanations and reasoning after sharing conclusions. People stop listening if you’re slow at getting to the point. Stop talking when you realize people aren’t listening. Ask a question. Focus more on what others need to hear and less on what you need to say. Never lie. Don’t make things sound better than they are, but speak with a can-do approach. Be vulnerable. Share your story. Say what you really want. Bonus: Avoid over-confidence. Be willing to change. 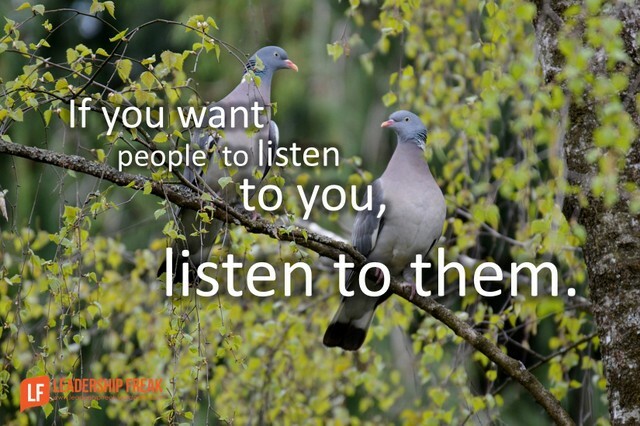 How might leaders get people to listen to them? It is an excellent strategy with clear tips. I believe it is really helpful for both the leaders and subordinates to interpersonal-communicate in any organization. I have been involved in dozen’s of negotiations. When I am ‘The Primary’, (the individual responsible for all direct communication with the Hostage Taker), and circumstances permit, I say very little at the onset of negotiations. I allow the individual to share his feelings and agenda till they regain composure and have talked themselves out. That id when I begin to interject some insight’s and common sense suggestions. The reason is simple, people really don’t care what you have to say if you feel you could care less about what they have to say. Bottom line, it’s about making a connection with people. People must like you, they must believe your concern for others is sincere, and they must believe you possess the knowledge and insight in regard to the topic at hand. But you’ll never get the chance if you don’t exhibit honest concern for what others think, feel, and have to say. Another set of great suggestions! Your visual sums it up. The more we’re impressed by what we know and the less we’re aware of what we don’t know, the more we talk and the less we listen. As leaders we must first believe others have something of value we need to listen to, that they matter and that until we convey these two things we don’t stand a chance of being heard. You have so much good stuff in this post I don’t know what to say. Think BB King. When BB King played, he made ten notes do more, more effectively, than some people do playing ten thousand. By not being overwhelmed with a wall of noise, you can hear (and FEEL) his music (his message) better. Say less, listen more, think as if you have a limit on how many words you can use, so make your words count. And be clear in you own mind, crystal clear, what you want someone to not just hear, but to hear and understand and FEEL. 3 Thoughts: 1) Dan, I’m not sure how you do it–providing so much insight in so few words; 2) I keep wishing for the ability to download your posts directly to my brain for instant access *when needed*; and 3) (like Alan above, there’s so much ‘good stuff’ in this post I don’t know what (else) to say.’ Keep up the good work, Dan…!